That’s what happened over my 10 day service learning program in Israel. This January I had the privilege to continue my Jewish journey as a participant in Yahel’s Alternative Break service learning program with the Ethiopian Jewish community in Ramat Eliyahu, a neighborhood in Rishon L’Tzion. The program was led by a combination of seasoned staff and remarkable student leaders. I noticed and was deeply appreciative of all the effort invested in planning the program. As a group of 14 students from the University of Maryland we spent our time learning about Ethiopian history, culture, and their stories and struggles integrating into Israeli society. We were hosted by families in the Ethiopian community. I have never encountered such warm and inviting people. We stayed in their homes for 10 days, and bear in mind that most of these families had many young children and challenging lives. It wasn’t very easy for them to host us, but they did it with love and warmth, and as the trip progressed we learned how to reciprocate that love and deep respect. I had the unique opportunity to stay with the Kess, the religious and spiritual guide of the Ethiopian Jewish community in Ramat Eliyahu. The Kess had a rather small 3 bedroom home with six very cute, energetic children. He hosted three of us and we took one of the three bedrooms, which means that all of his six children crammed into one of the other bedrooms. This didn’t seem to bother them. The children were so warm toward us and were always excited to see us, play games with us, and do their homework with us when we spent time with them in the evenings. I spent many nights listening and learning from the Kess about Ethiopian Jewish life and the struggles he and his community went through in their journey to Israel. In terms of our tangible service activities, we painted and cleaned up a bomb shelter and an absorption center, helped construct a community garden, and helped repair an elderly woman’s home. These service activities were well received by the community. The elderly woman we helped had such a sad story; her husband had passed away the previous year, she was struggling to make a living on her own, and her home was in disrepair. After we finished repairing and painting her home, she had this glowing smile and I felt a connection to her through the chesed I had done for her. The joy on her face was something still blazed into my memory that I will never forget. She really was touched by our care and concern for her difficult situation. An important element of the trip, on top of the warmth of the host families and the service projects we worked on, was the group dynamic. I was very impressed with every single one of the 14 students on our trip. Everyone was clearly very intelligent, curious, compassionate, and deeply respectful. It was a perfect combination that enabled us to have a safe space to engage in deep meaningful discussions about a host of issues affecting our Jewish outlook. We had moving conversations in which we could express our honest opinions on topics such as the value of service trips, our relationship to the rest of the world and to Israel, our connection and viewpoint on Judaism… People were so honest and had fresh perspectives to share on these issues. What made the trip amazing was the safe place we created in which we could grow and explore these questions and issues in an honest and respectful forum. In my Jewish journey so far I have been exposed to spirituality through prayer and textual learning. I have done chesed activities on an informal basis and participated as a Jewish outreach advisor in a national Jewish organization. But despite my 13+years of Jewish education/involvement, I picked up an important piece of the puzzle on the Yahel service trip. A unique and fundamental facet to being a Jew and a human being, that was dormant in me prior to this trip. I started to learn how to feel the world around me, and not just to feel a connection to the supportive community and individuals who fall within my comfort zone. Prior to this trip I didn’t feel empowered to connect to and seek to make a difference in the lives of people outside of my comfort zone; people less fortunate than me who have less than me. However, this trip challenged me to face this value and evaluate myself deeply and with 100% honesty. Ultimately, it brought that value in me to the surface. It exposed me, challenged me, and guided me to learning how to feel a connection to these issues and the challenges in the world around me. It empowered me to feel that I can stand up and take an active role to help improve the lives of people who struggle and have less than me, and to develop a connection with those people. I feel more honest about my opinions and recognize that I still have much to learn about these issues. I feel more open minded and not afraid of those who are different me. I am no longer afraid to step outside of my comfort zone. Yet, I am fully aware that I will continue to be wrapped up in my own life pursuits. That won’t change, and honestly it shouldn’t change. We all have goals and should strive to achieve them. What has changed, though, is that I see my future destiny intertwined with a focused effort to help those less fortunate than me and to continue to feel a connection to the world around me. I’m not sure where that will take me and how exactly it will translate into service, but I am ready for my next Jewish adventure! And I will always remember that the Jewish journey never ends. 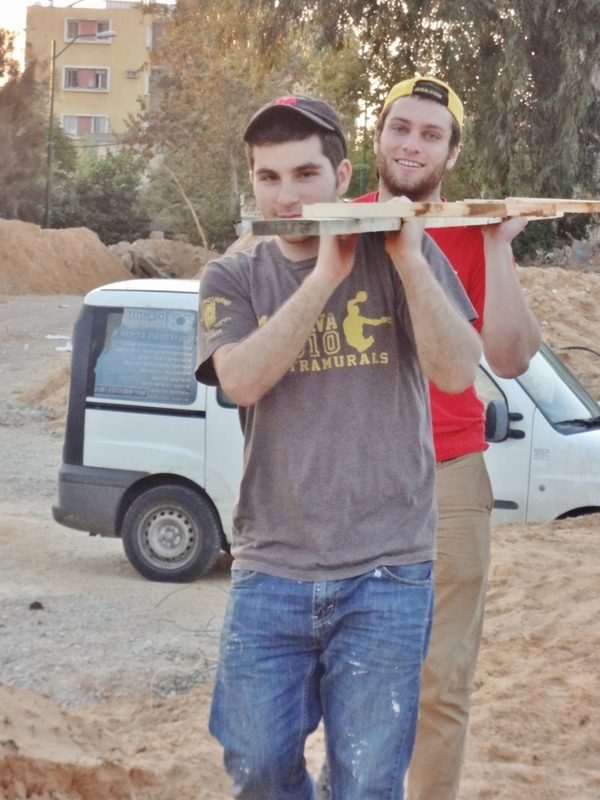 Here, Yonatan builds raised beds in the Ramat Eliyahu Community Garden in Rishon L’Tzion with other Insight Program participants from the University of Maryland Hillel. Yonatan Isser is a senior at the University of Maryland, College Park in the A. James Clark School of Engineering. He is completing his BS in Civil and Environmental Engineering in May 2013 and will be working in the construction industry on high rise buildings. Yonatan has been an active leader in the Orthodox Jewish community at the University of Maryland for three years and his interests include reading, running, basketball, and traveling. Yonatan just returned from spending 10 days on Yahel’s Insight Program in Rishon L’Tzion, run in collaboration with Gar’in Ichud of Friends by Nature and supported by Repair the World.